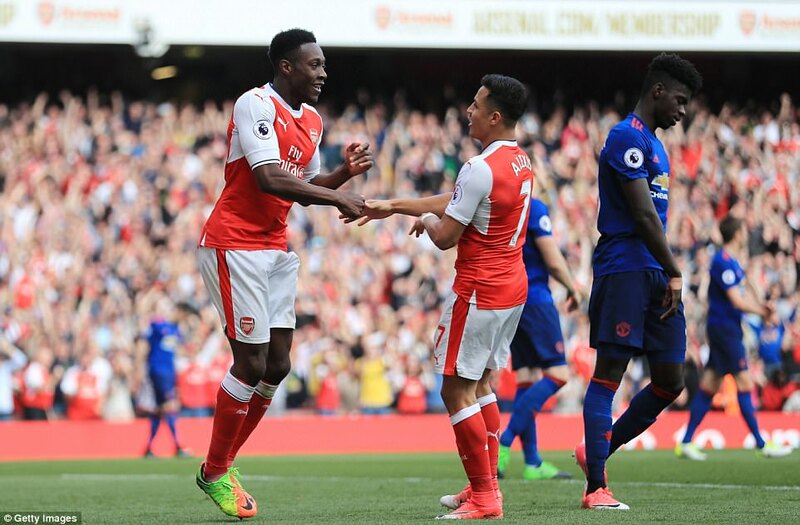 It is fair to say Danny Welbeck has proved his point now. 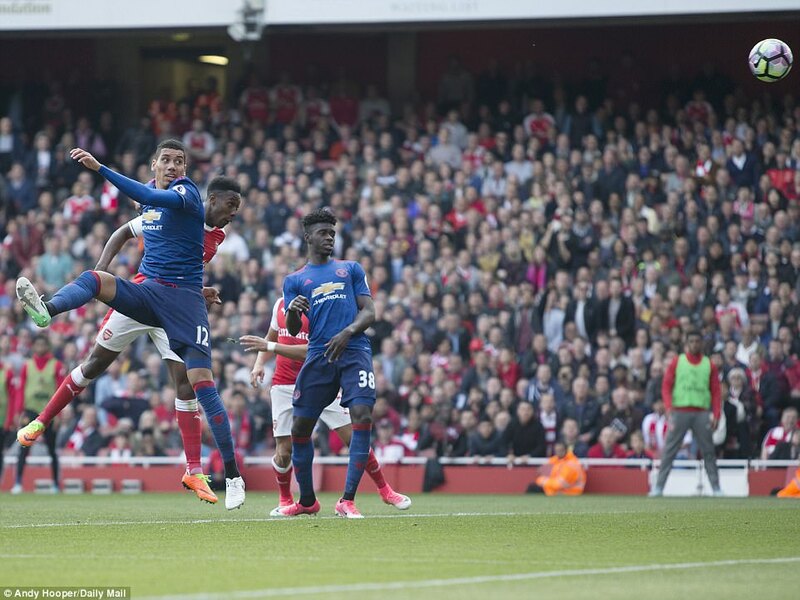 This was his third consecutive goal in matches against Manchester United. Do you think he might bear the tiniest grudge? 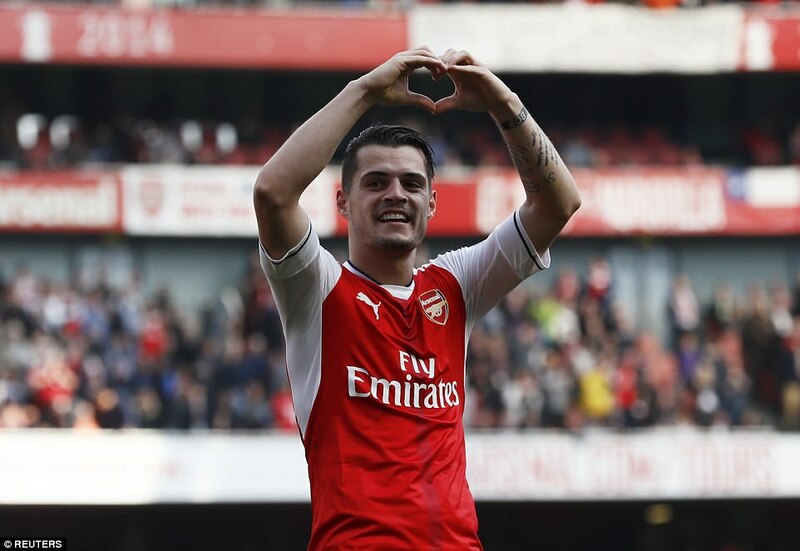 No, he hasn’t been prolific for Arsenal in his time here. 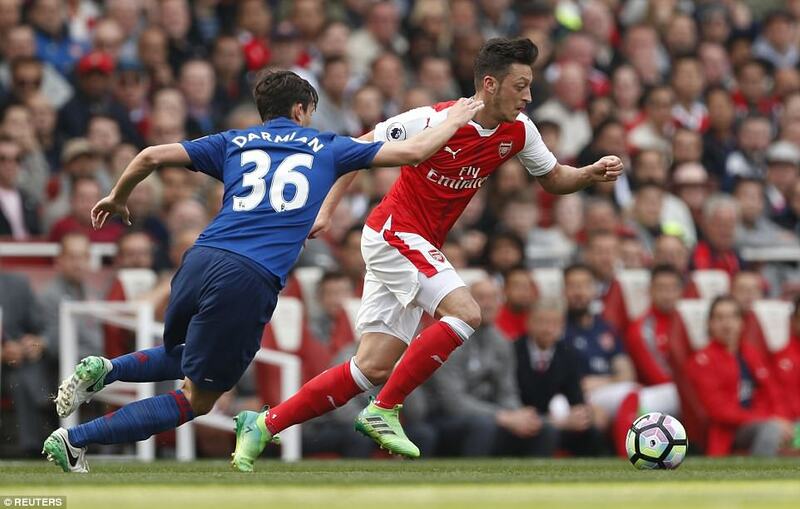 He has also been terribly unlucky with injuries. 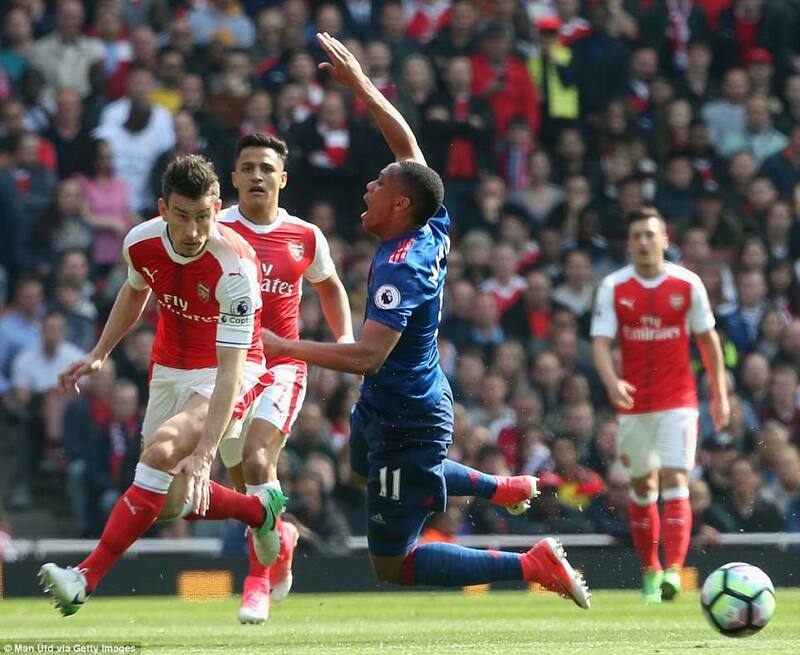 Yet here was a reminder of his potency, a well taken header that put the game beyond Manchester United and restored Arsenal’s outside hopes of earning a place in the Champions League, if Liverpool continue to falter. 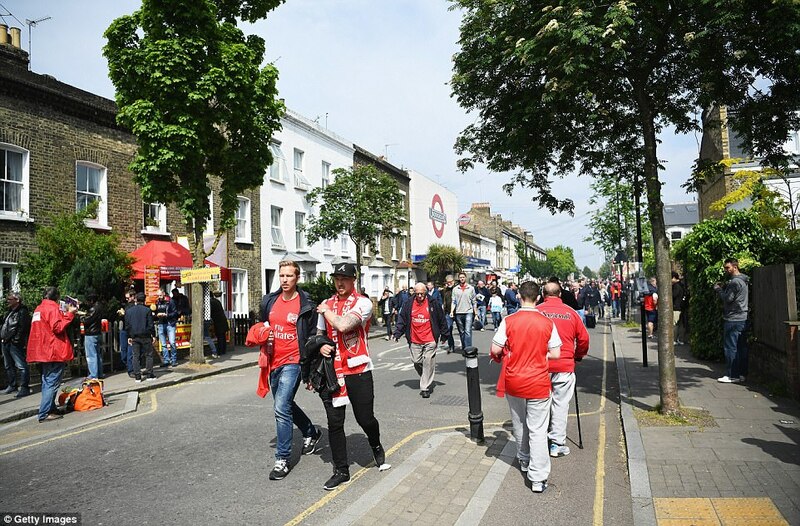 They still need to win all their games in hand, and even then would still be a point short of what is needed – but Liverpool are losing momentum at the wrong time and Arsenal’s remaining fixtures are relatively benign. Southampton and Stoke away. Sunderland and Everton at home. 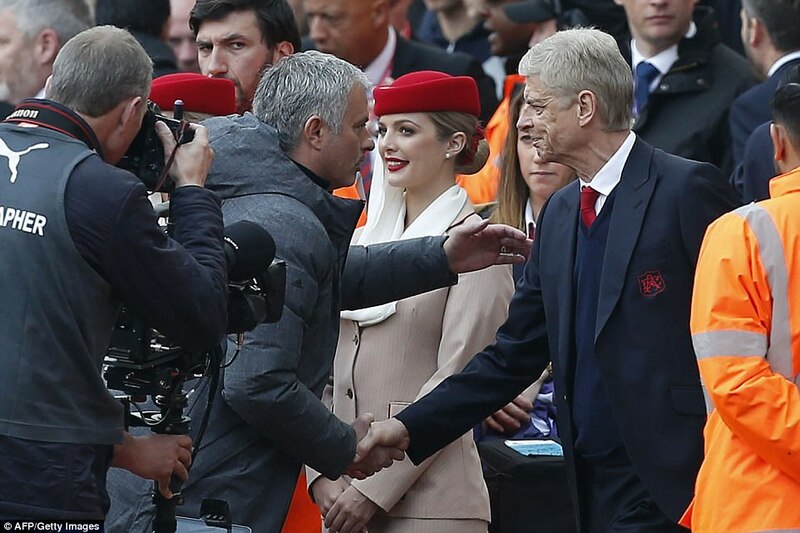 Hope springs eternal – and not a fly past in sight, on the occasion of Arsene Wenger’s first competitive win over Jose Mourinho. It was deserved, too. 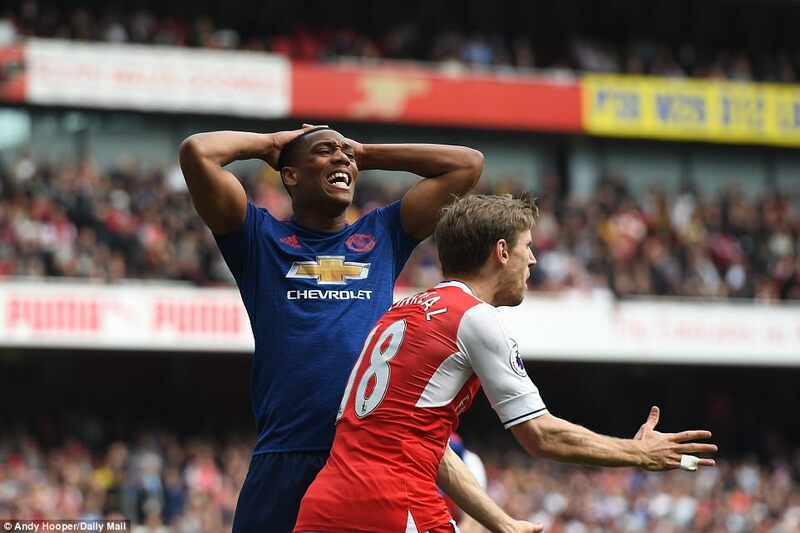 Mourinho may have fielded many of the players on the bench against Celta Vigo on Thursday, as promised, but by the end he had some of the A team on – not least Marcus Rashford, deployed after the second went in – and it was still not enough. The best team won. 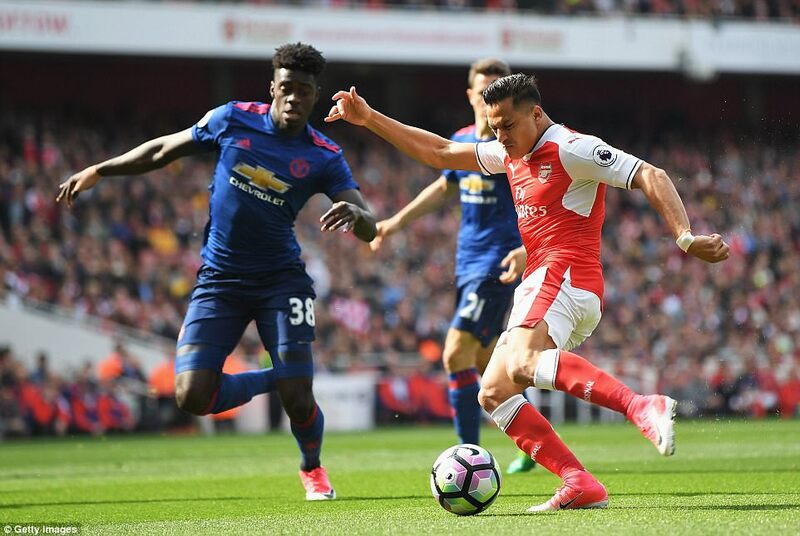 Manchester United came to do a job, but their negative plans were undone by a fortuitous break that led to the first goal. 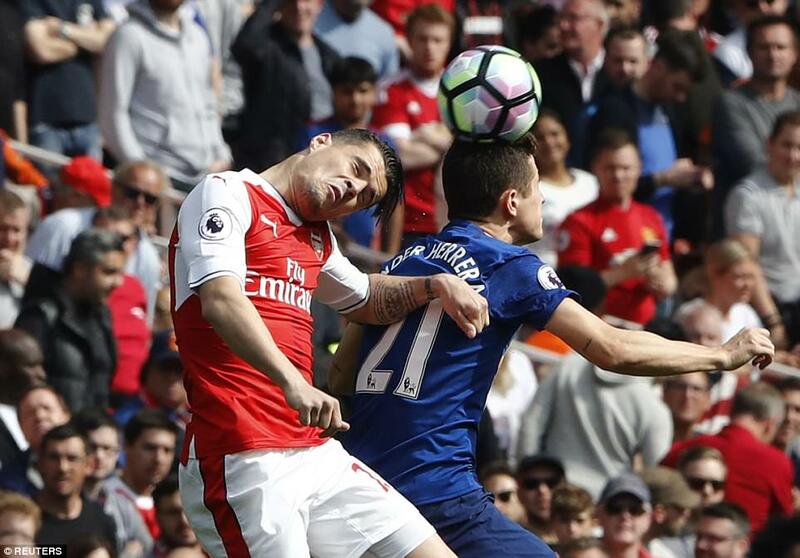 Granit Xhaka collected the ball from a throw in, and was allowed too much space. 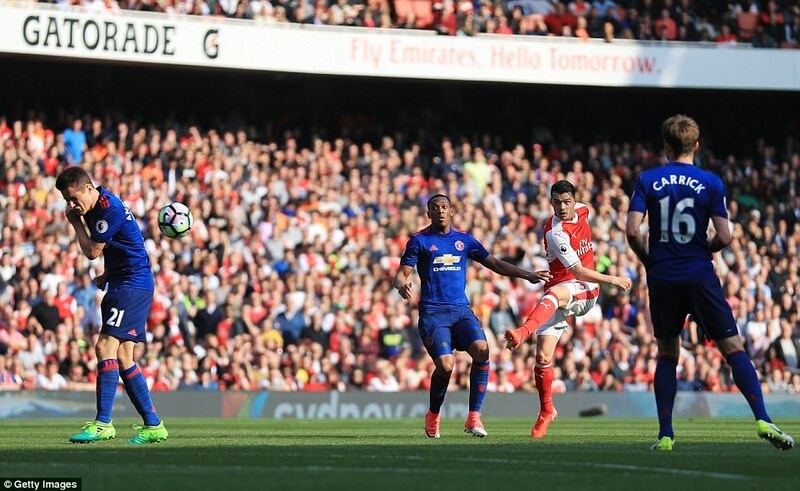 He got within range of goal and hit one, the ball striking a flinching Ander Herrera on the back and looping up and over a despairing David De Gea. 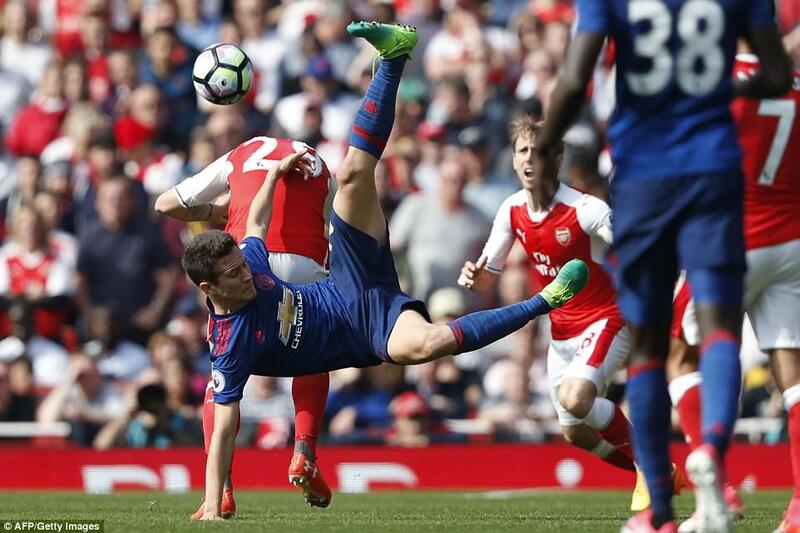 Had Herrera taken one in the face, maybe Arsenal would have become disheartened at United’s resistance. 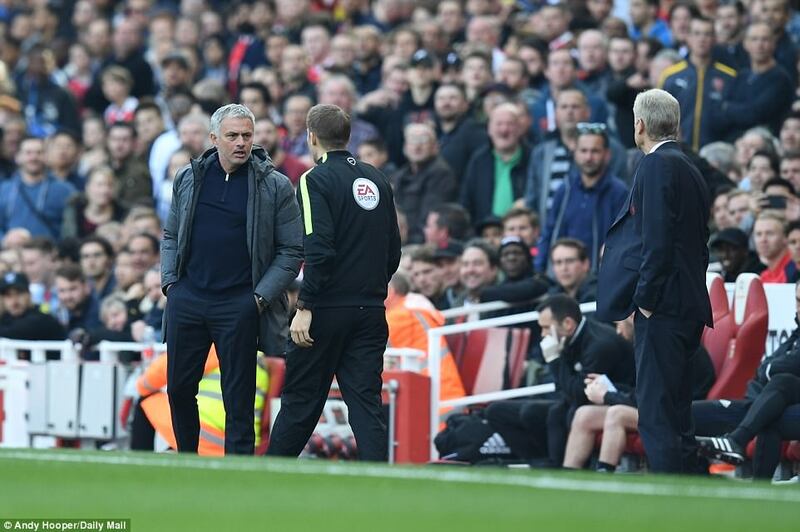 He was substituted soon after, whether tactical or as a not particularly subtle reminder of the resilience Mourinho expects only he will know. 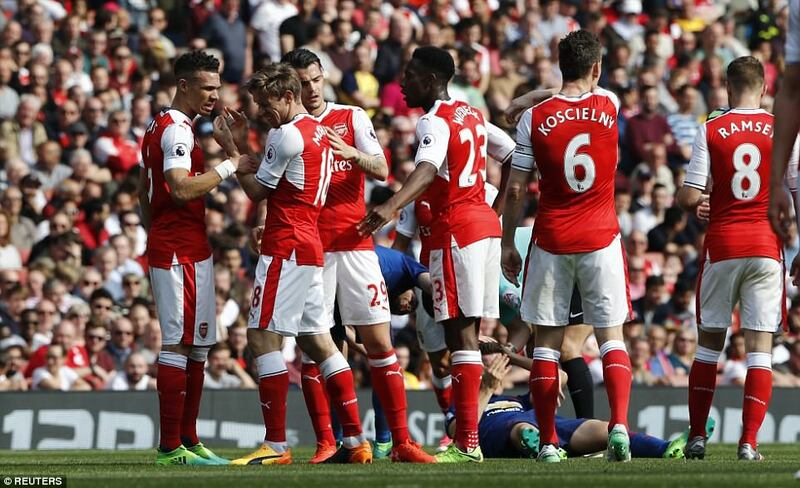 Nothing lucky about the second, though, which came from Arsenal’s next meaningful attack. Alex Oxlade-Chamberlain – who is enjoying a new lease of life in the wing-back role – lost the ball, won it back, and hit a quite superb cross from the right. 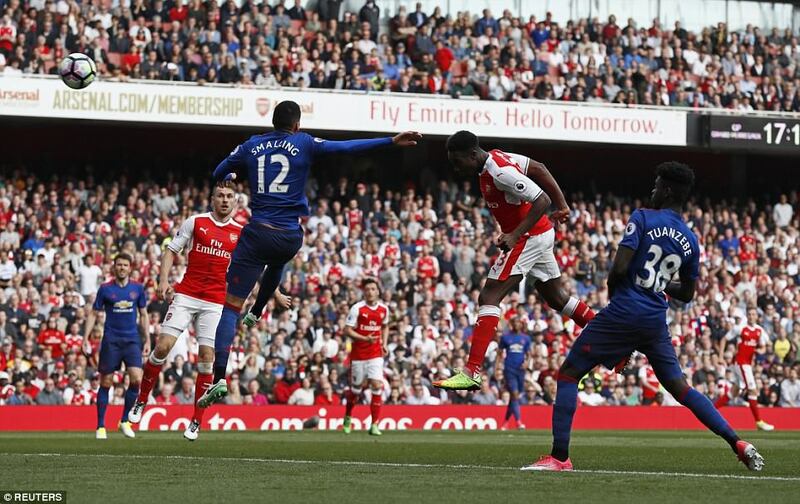 Chris Smalling misjudged it utterly, leaving Welbeck in space to head powerfully past De Gea. 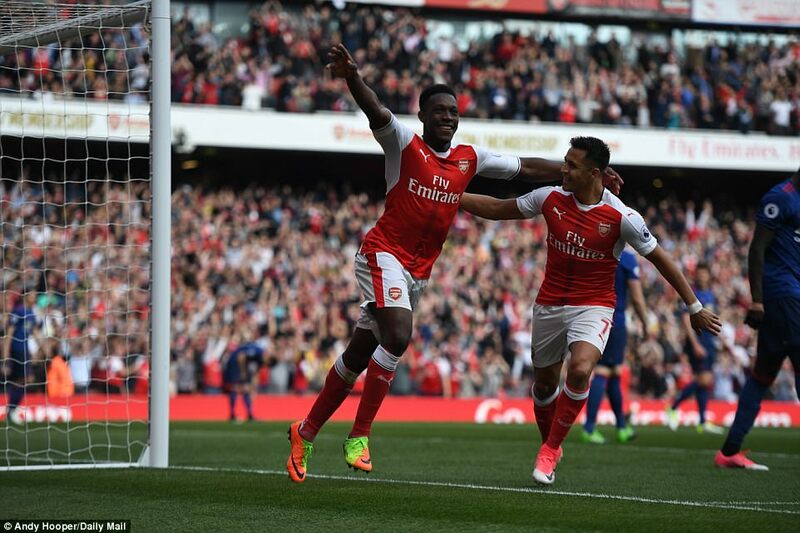 That was Oxlade-Chamberlain’s seventh assist of the season – as many as he has achieved in his previous five seasons. 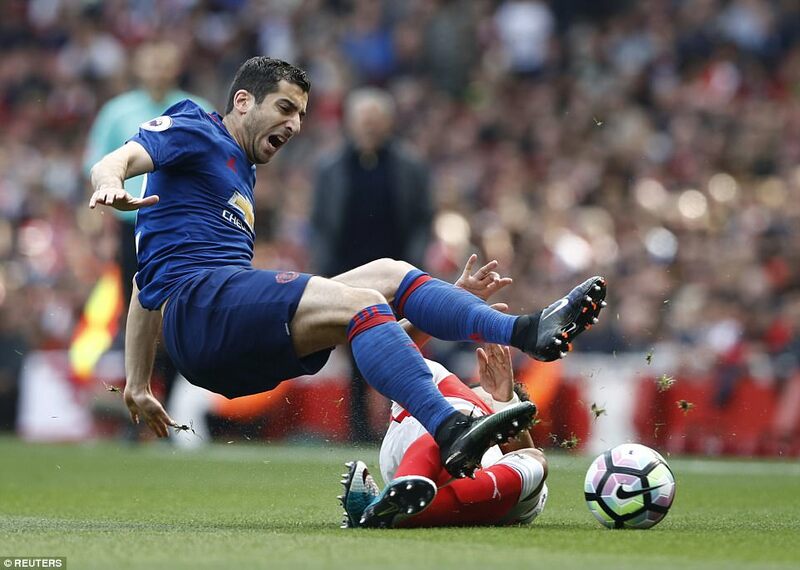 It was not the best of games, but then again this has not been the best of seasons in the league, for either club. 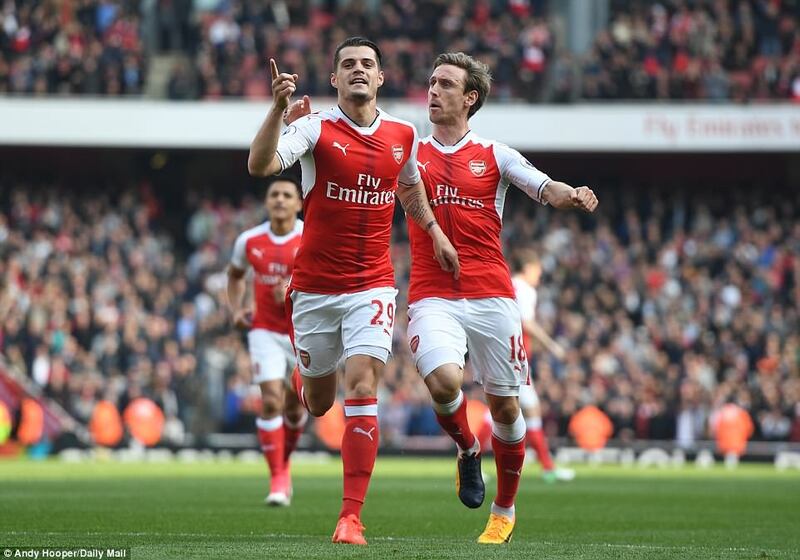 Both remain outside the top four and, if it ends like that, it will be a first in the Premier League era. 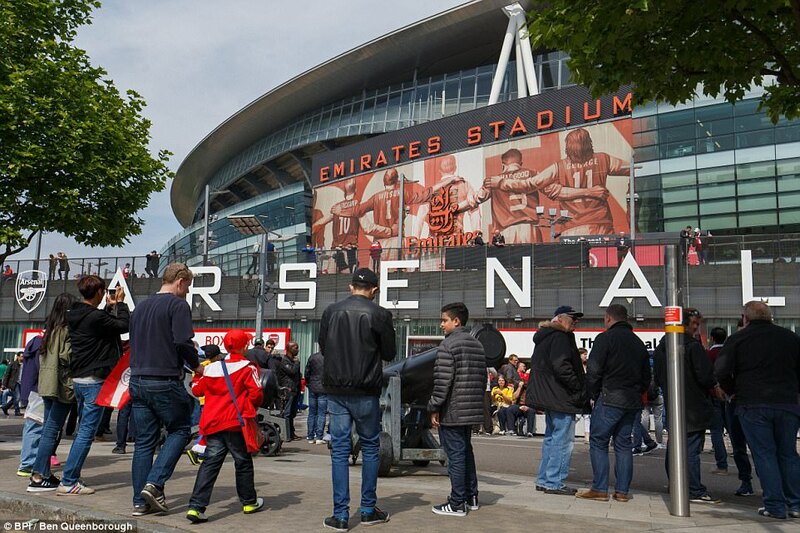 Indeed, it was 1978-79 the last time both Arsenal and Manchester United failed to feature in the top four, and no amount of blaming fixture congestion, financial doping or injuries, can hide the disappointment inherent in that. 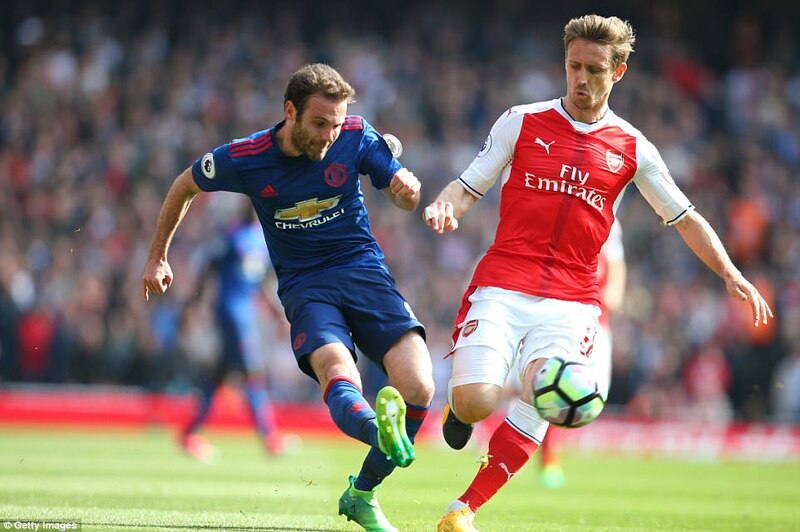 Jose Mourinho had talked about playing Manchester United’s second string in order to concentrate on the Europa League semi-final with Celta Vigo – but his reserves would be the envy of most rivals. 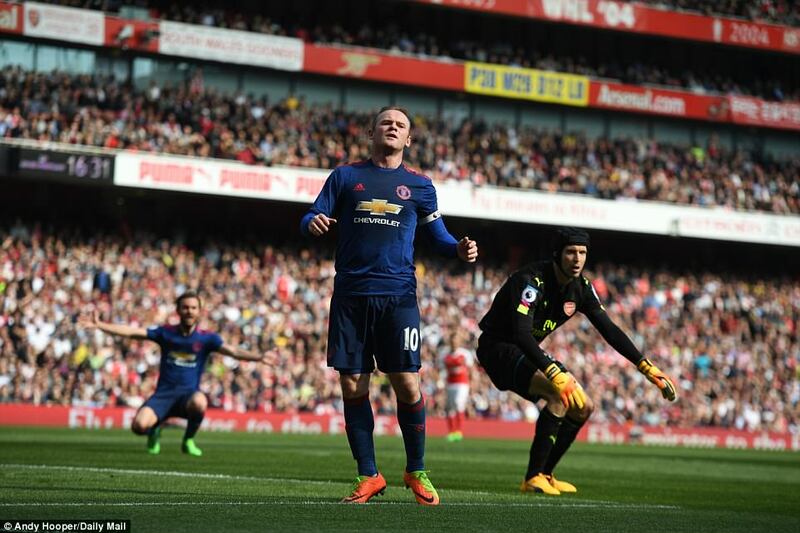 Juan Mata, Wayne Rooney, Anthony Martial, Henrikh Mkhitaryan, Ander Herrera, Michael Carrick, David de Gea – almost all of these would be first-teamers at many clubs. 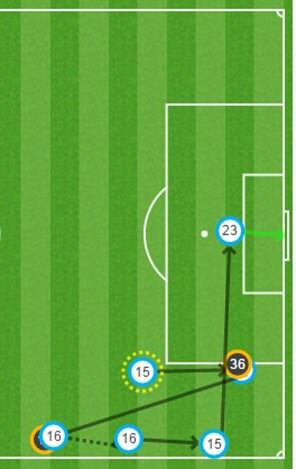 The build-up to Danny Welbeck’s goal, Arsenal’s second of the match. 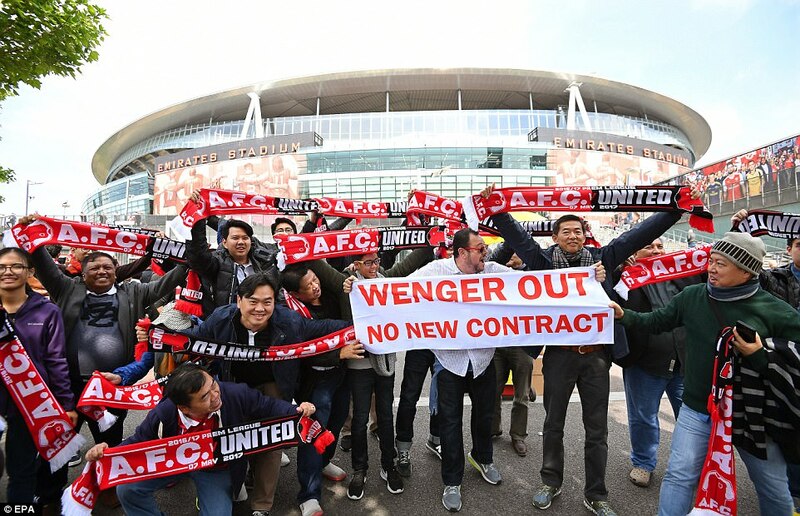 Certainly, they had enough to cause Arsenal problems, and so it proved. 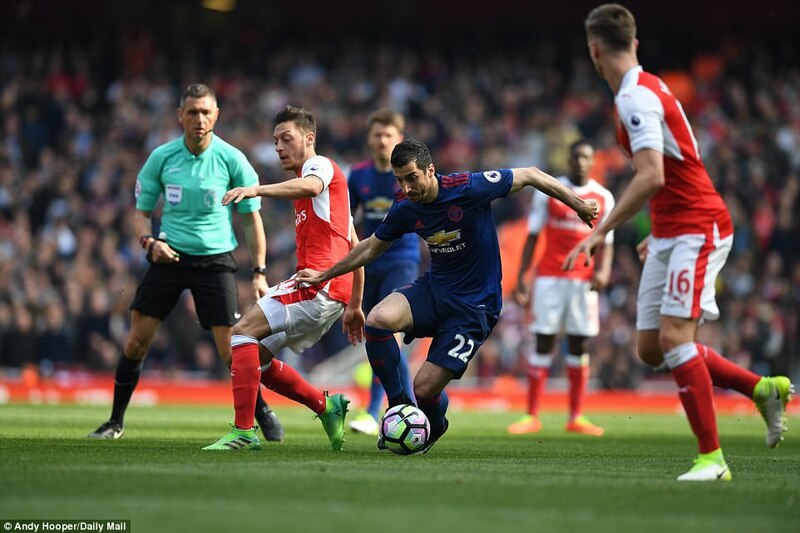 After six minutes, Rooney picked out Mkhitaryan whose pass found Martial, Petr Cech saving well at the near post. 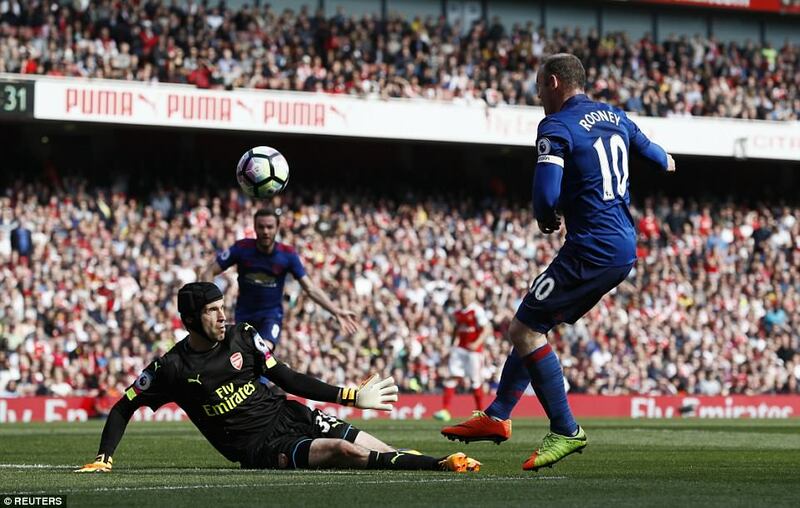 That was the best of it for United in the first-half, though, unless one counts a chance not of their own creation when Rob Holding hit a woeful back pass that fell to Rooney lurking in the penalty area, Cech called upon to rescue Arsenal once again. 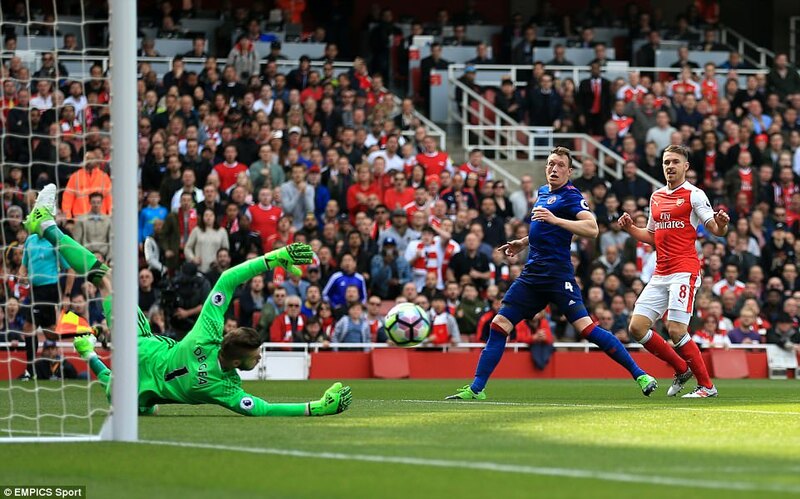 Those moments aside, Arsenal had the best of it and De Gea in goal needed to be in top form. 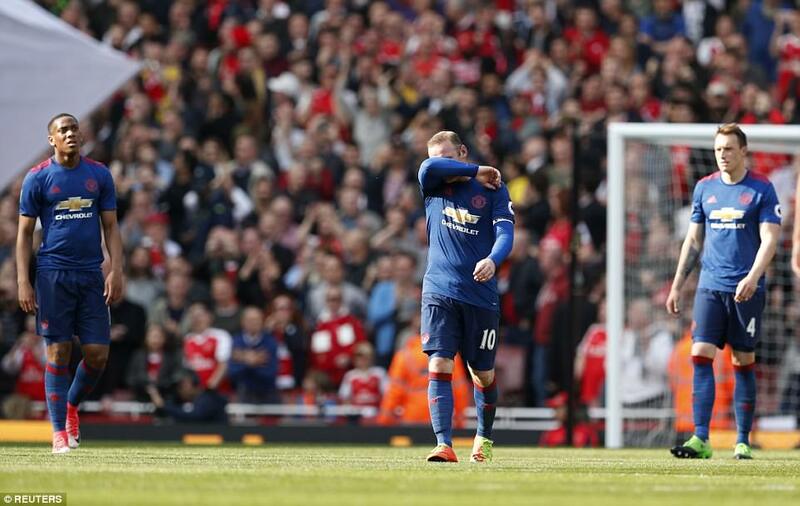 After ten minutes, Aaron Ramsey tested him with a low shot and later Alex Oxlade-Chamberlain did likewise, changing his angle and leaving Rooney embarrassingly overcommitted to the block. He flew so far past, he nearly had to pay to get back in. 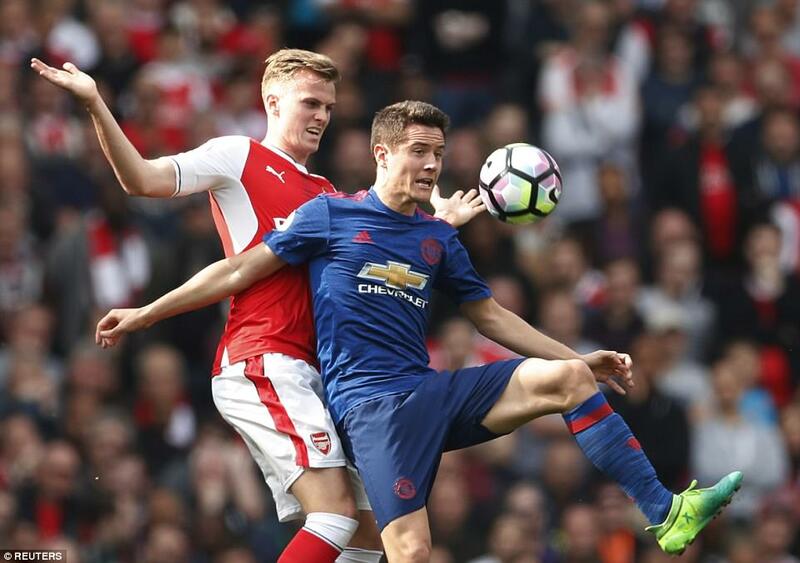 United’s recent unbeaten run may have included too many draws – particularly at home – but the sequence has shown that Mourinho is at least getting his defence organised. So it was here. 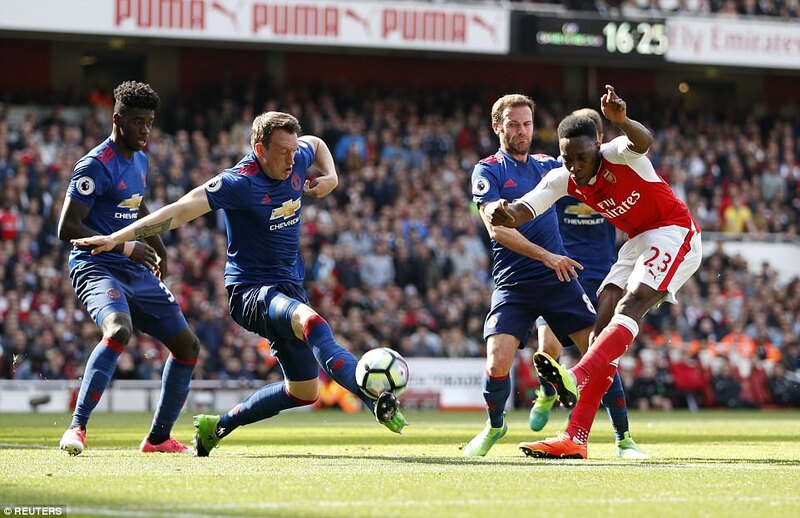 Phil Jones made two excellent blocks in quick succession, the first from Alexis Sanchez after an Oxlade-Chamberlain corner, the next from Danny Welbeck after Ramsey had cut the ball back into his path. 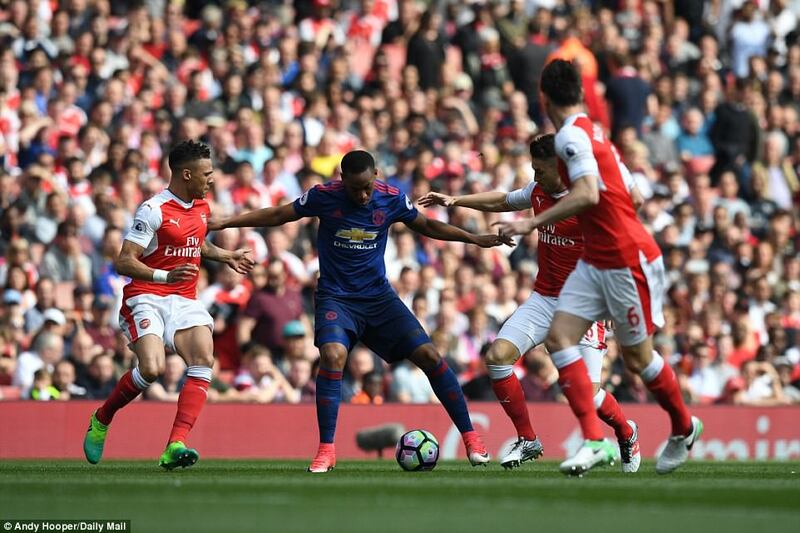 At other times, United got ten men behind the ball, leaving Martial alone in the centre circle.